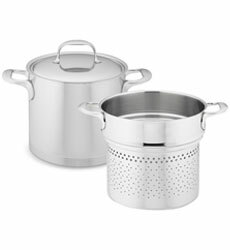 Manufactured in Belgium, Demeyere Cookware has been well reputed as the finest cookware available for over 100 years. Each individual piece of Demeyere cookware is constructed with a specific task in mind. Meaning that the materials for conductivity, how and where they are placed in the pan, and the shapes of the pieces and handles have been carefully researched and designed. The proprietary Silvinox finish brings many of the free ions to the surface creating a more "slippery" stainless steel finish that is highly polished and doesn't show finger prints. The seven ply bases come in two types; Inducto Seal and 7-Ply. The Inducto-Seal base includes a 2mm copper plate for maximum heat distribution, while the 7-Ply utilizes pure aluminum disks encasing an aluminum alloy. 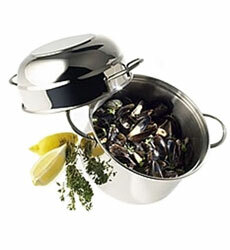 Demeyere cookware is excellent for induction stoves, but suitable for all heat sources. 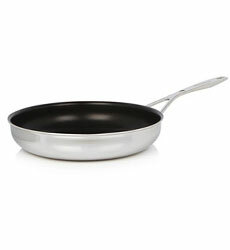 Long recognized as the best cookware available, with a lifetime warranty and reputation for excellence.